We’re so excited to see what’s in store for us this year! Our number of mentorship participants has grown quite a bit. This isn't even everyone! Ms. Williams gets acquainted with her new mentee, Tai’Mhariya. Our Volunteer Coordinator, the Marvelous Mrs. Miner! Mentor, Ms. Key, gets acquainted with her new mentee, Lizzie. Although everyone couldn't attend the 2017-2018 end-of-year reception, it was a great end to GRACE's pilot year. Though it has been a challenge, we look forward to continuing with this program! 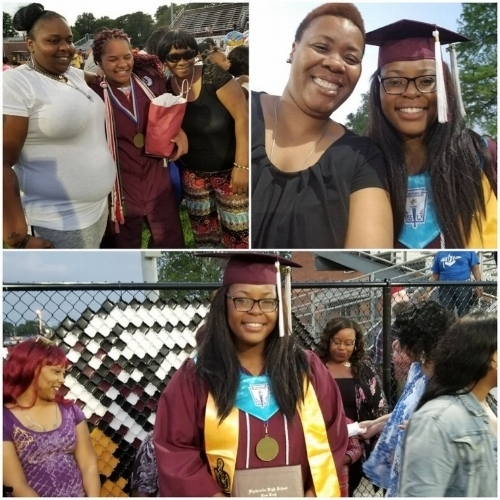 Ms. Key, one of our mentors from the community, came out to support her two mentees, Ariona & Shi’Anne, at their graduation this past May.